Please complete the form below to learn more about Cambridge Friends School and schedule your tour! At Cambridge Friends School, we are dedicated to providing students with a strong and meaningful education. We're a private, independent day school in Cambridge, Massachusetts that provides an education guided by Quaker principles for grades Pre-K through 8. Cambridge Friends School was founded in 1961, and since then we've continued our focus on academic achievement and developing students' intellectual, physical, creative, and spiritual potential. You can learn more about our mission and philosophy here. Our pre-kindergarten, kindergarten, elementary, and middle school students have gone on to great high schools and colleges after graduating from Cambridge Friends School! Our belief in the focus on middle school years helps students develop core skills and create successful academic habits and attitudes during a critical time in their education. One of our biggest goals at Cambridge Friends School is to provide project-based, experiential learning. Classes at CFS cover everything from mathematics to Spanish to drama. Our diverse curriculum offers engaging class topics for all grades and types of students. For a more in-depth look at the classes we offer, check out our curriculum. As a Friends school, we are guided by the six Quaker Testimonies of Simplicity, Peace, Integrity, Community, Equality, and Stewardship. 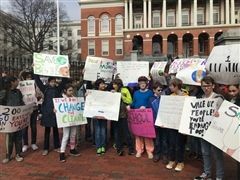 Students at Cambridge Friends School have plenty of opportunities for community involvement, including events like the Day of Service and our annual LGBTQ+ Pride and Martin Luther King, Jr. assemblies. At CFS, community is one of our key principles and we practice it often. We focus on creating a welcoming, supportive, and inclusive group of learners, which helps strengthen our students, staff, and community. Why is Cambridge Friends School Different? Our philosophy at CFS involves a commitment to social justice and a love of learning. Our curriculum is designed to develop broad literacy skills and to stimulate curiosity within our students. It is because of this that our students have found success, not just in our elementary and middle school, but in high school and higher education. At CFS, our teacher to student ratio is 1 to 5.3 and with an average class size of just 12 students, parents can know that their children are receiving an outstanding and personal education. Furthermore, our strong values of peace, community, tolerance, and respect assure that all students will feel welcome at CFS. Learn more now about how your child can become a student at Cambridge Friends School! CFS hosted its annual Alumni and Faculty/Staff vs Grade 8 basketball game last Wednesday, March 13. Huge thanks to all who attended and helped to make this event successful! After a heated match-up between the two teams, the eighth grade overtook their faculty, staff, and alumni with a final score of 44-32. This reverses the field from last year’s Alumni game, where the faculty, staff, and alumni beat out the eighth grade with a score of 41-36. Post-game, pizza and cupcakes were enjoyed by all, friends reunited, and all reminisced about their CFS days. We’ll see you on the court next year! Be sure to check out game photos by clicking here! CFS graduate of the class of 2015 Danny Rivera shined alongside his Boston Arts Academy classmates in their production of Memphis: The Musical earlier this year. The performance was staged at the Strand Theater in Dorchester and was followed by a talkback on racial justice language facilitated by Boston Arts Academy Foundation board member and celebrated actor Malik Yoba. 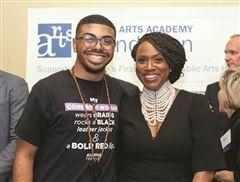 As written by the Dorchester Reporter, “The Friday night premiere was preceded by a VIP reception featuring Congresswoman Ayanna Pressley, who received the BAA Champion Award.” Rivera was able to snap a picture with the Congresswoman in a shirt perfect for the occasion (see lead photo).